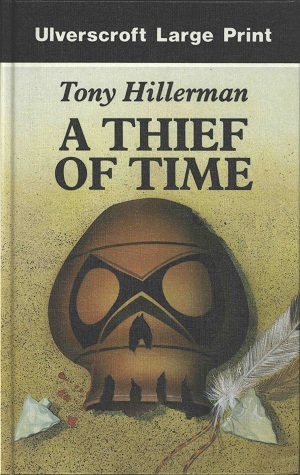 This is the first large-print edition of a A Thief of Time printed in the United Kingdom. This edition was published in 1991 by Ulverscroft and F. A. Thorpe (Publishing) LTD. in Anstey, Leicestershire, Great Britain. The cover art is not credited; however, it depicts a ceramic vessel that is strategically broken to resemble a skull with blood leaking out the opening and it is surrounded by two projectile points and a feather. Binding: Full-color boards with LARGE PRINT, the title, author, publisher's logo, and publisher's name printed vertically on the spine.